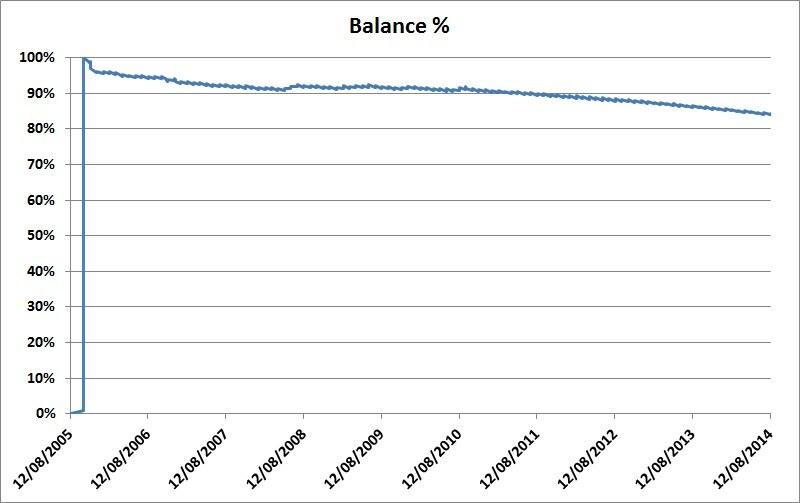 Here’s a graph of my home loan, which I got just over nine years ago. The loan was approved in August 2005, but only took effect in October that year (the huge leap on the left). In the first year or so I was able to pay it down a bit. It only took me about 8 months to get the balance down to 95% of the initial loan. With interest burning up most of the payments, it took another 5 years to get down to 90%. This of course is why the graph looks jaggy — each month we go down a bit, and up a bit. In the past few years I haven’t concentrated on paying it down further, but I do have a healthy working balance in an offset account. That combined with the current low interest rates have meant it’s taken under 3 years to move down from 90% to 85%. The bank reckons the current forecast term is still 20 years and 3 months (gulp). The nature of big loans is that the balance starts to drop faster the further you are into it, but one way of ensuring that would be to lock-in a fixed interest rate. The last time I tried this was precisely the wrong time — just before the Global Financial Crisis sent rates tumbling. Still, rates are pretty low at the moment, so now might be a good time… though you can bet whichever way I go, the bank will win. * tax you would have paid each year on interest/dividend income if you had invested your down-payment in term deposit/shares in 2005, instead of a house (and then rented). But you’re right, the banks still win! Banks win 95% of the time you lock in interest rates. Only do it if you can’t afford the repayments if they go up. If you invested in shares in 2005, you’d probably be behind. A huge bout of inflation is on the way. When the value of the dollar declines, the cost of everything will go up, and the demise of Australian industry means that there won’t be any benefit from Australian production. Daniel, what is your view on the property bubble in Australia.